As I type this, the man cave is making giant leaps forward, but it’s not ready for primetime yet. So we’ll have to recap that next week, or possibly the week after. 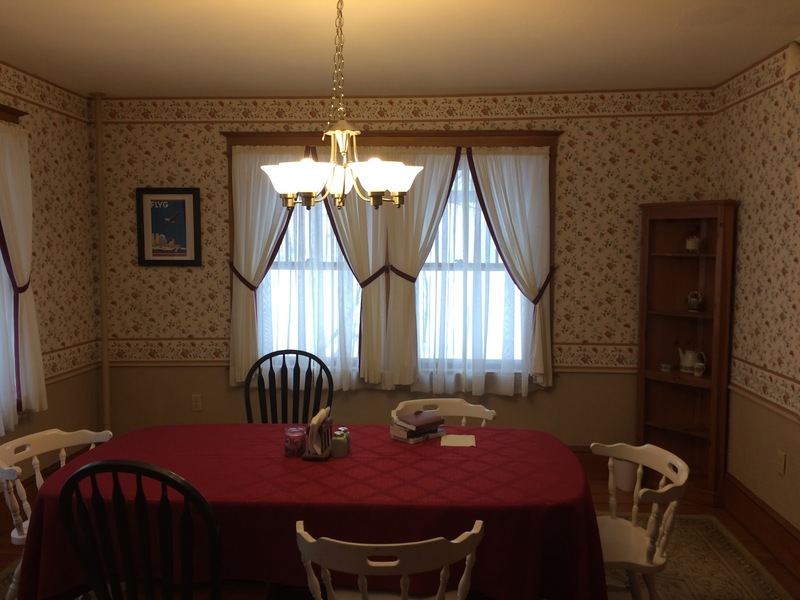 This week, I am seeking your advice & thoughts on the dining room. It’s going next. 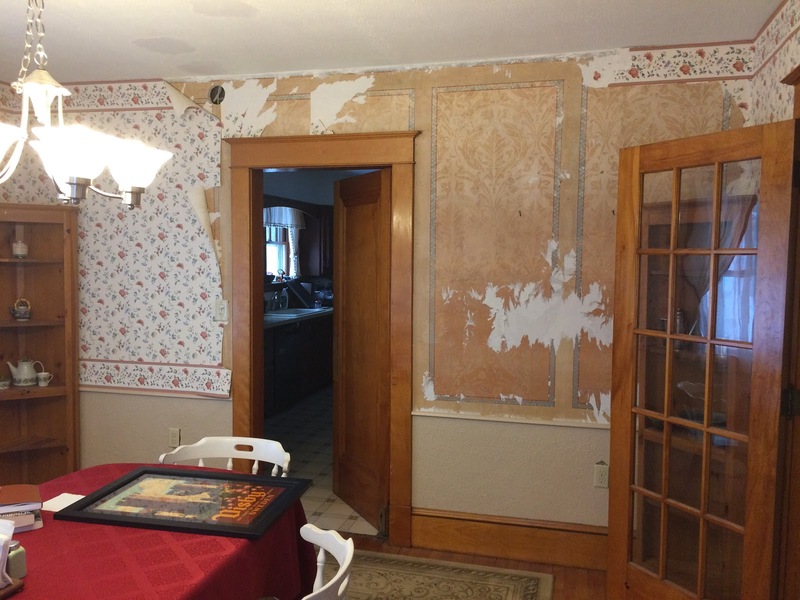 Previously, we pulled up the carpet, replaced the light fixture, patched the holes in the ceiling, and pulled down some of the wallpaper, but that’s it so far. The bulk of it needs to be done still. The fourth wall is almost entirely french doors. My husband wants badly to keep the stenciling underneath the wallpaper, but I strongly suspect that won’t be possible. In the small amount we’ve already pulled off, it’s clearly pretty badly damaged, both by holes and by plaster near the ceiling. 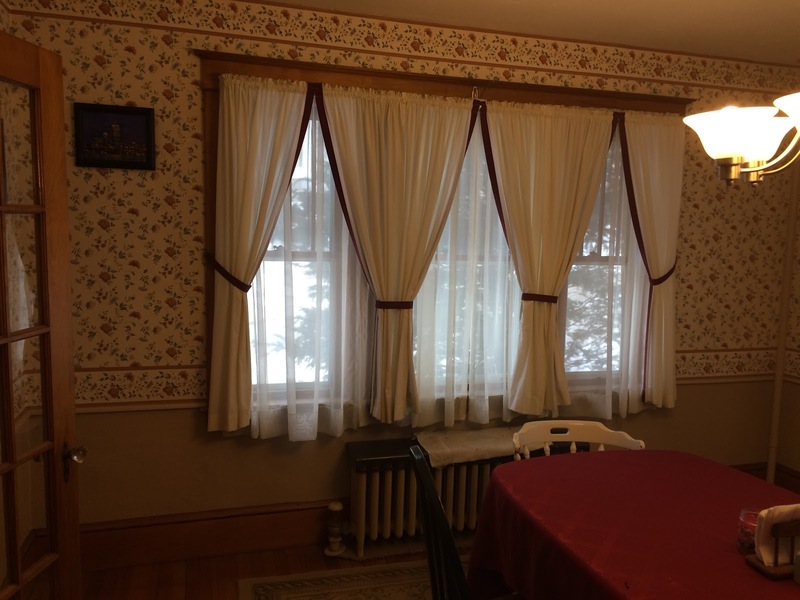 Odds are there are other bad parts on the rest of the wall that just can’t be saved – or would require extensive cleaning and inpainting to look decent, and that is soooooooo not in the budget. If the budget extends to art conservation, that will go toward the mud room mural. For a long time, my best idea was arts & crafts wainscoting. 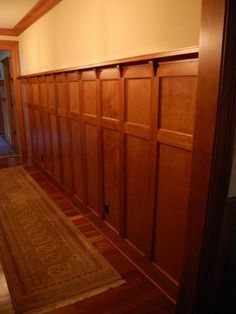 In this scenario, we’d make custom wainscoting out of maple lengths all around and either a) paint it or b) stain the wood and paint the wall behind. Here’s the style I’m talking about, in a few variations. Then I saw these pictures, and cue heavy breathing. I think I need to start sketching this out, maybe? What about one of these art deco fans in the middle of the larger wainscoting from my first idea? Am I just getting waaaaaaaaay too complicated? 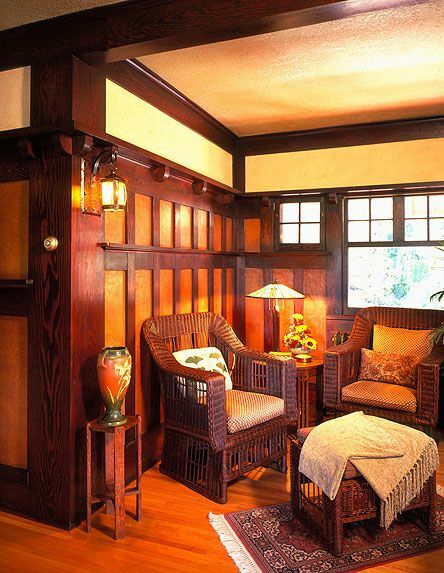 – art deco wainscoting, and if so, white, all wood, or wood frame with paint behind? – something more elaborate like the middle examples? 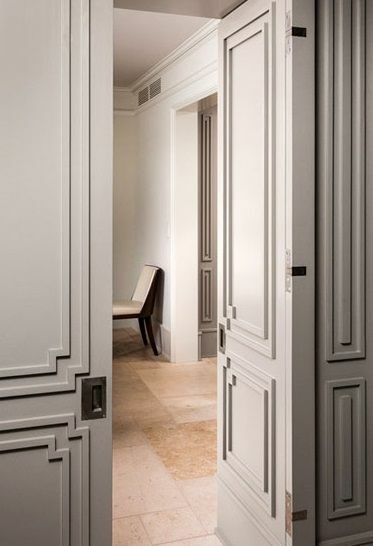 – art deco wainscoting with a fan design in the center? I am a huge fan of the art deco look! I love the chevron style in the desk photo…hurgh. Not gonna fit in my place! 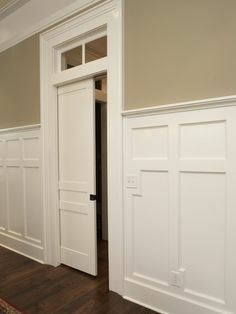 I would definitely not put the wainscoting up too high (especially in a room where the primary use is sitting) and use the brighter color on the top layer. With the maroon and cream? I would probably tone those down a shade or two from the table colors to make the walls less busy, but complimentary, keeping the table the focal point. I kinda agree with your husband about the wall stenciling, but it's understandable. Such a shame that it was wallpapered over in the first place! I'm really enjoying watching the history being uncovered in this house. 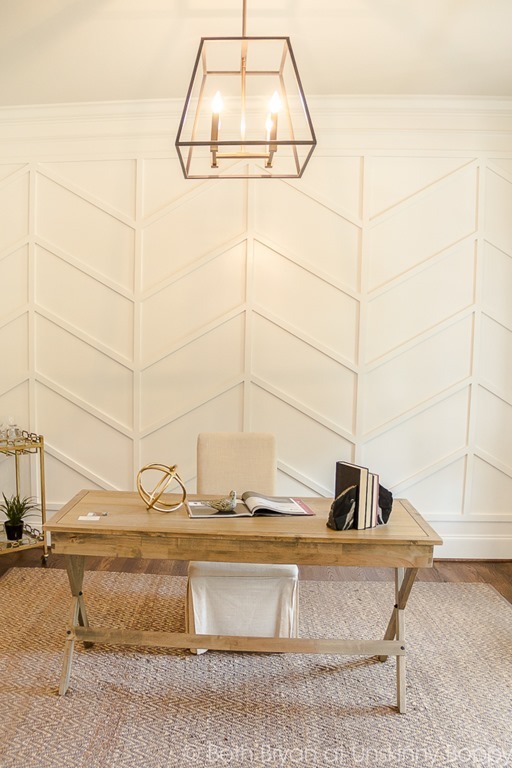 That tone-on-tone wainscoting in the chevron pattern is the stuff of DREAMS. 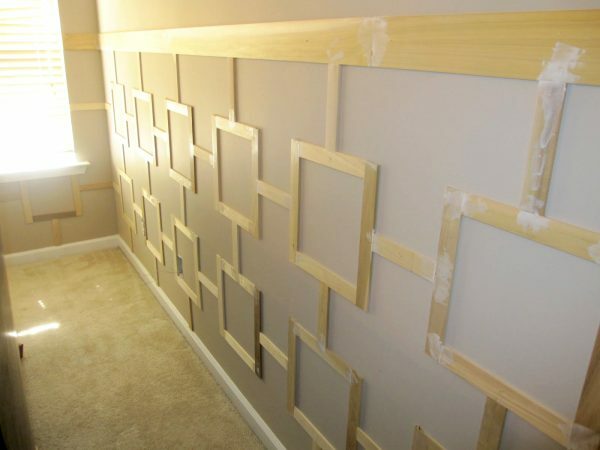 Have you considered paying homage to the stencil by adding mouldings in the exact same place and pattern? I would then paint the entire wall and mouldings all one colour like your “heavy breathing” photo. My approach might be to paint the room (possibly over the wallpaper) and go riding…. I love most of the white-on-white versions. Meh to woodstain, visceral NOPE to white and wood. The shapes are the star; I'd try to get out of their way as much as possible, if it were my house, which it is not! 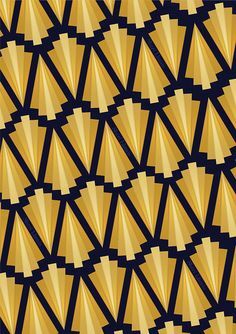 Love that art deco style chevron! Why does wallpaper have to plague this earth? Some kind of penance for original sin, I can only imagine. Over the weekend my mother suggested white bottom w/ paneling + art deco wallpaper on the top and I had this almost visceral recoil. This room actually does get decent light but your point is well-taken! I have to be careful not to overwhelm it. I have to think very hard about how high the wainscoting should go up. It may require some visual aids in the space itself to think through. RIGHT?! Even if it doesn't work out for the dining room, I have a backup plan for it. …well that is really really interesting. Hm. Hmmmmmmmmmmmmmm. Oh I LOVE the art deco idea!